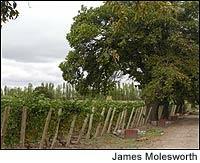 A large chestnut tree stands guard over the old vines in the Finca Altamira vineyard of Achával-Ferrer. Argentina is on a roll, with three consecutive outstanding vintages (2002 through 2004) allowing the country's best vintners to showcase their top varietal: Malbec. The bulk of the '03s are just arriving now, along with the first of the '04s.